I have been following the New York Fashion week (who hasn't? 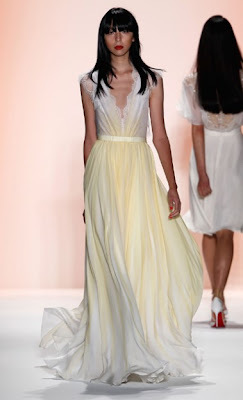 ), I have fallen head over heels in love with Jenny Packham's collection. The collection is very feminine, perfect for Summer evening garden parties, weddings, balls and so much more. A pallet of natural and bold colours and soft flowing fabrics would make any woman feel beautiful. This collection will also make a big splash with the celebrity world, we will no doubt see a few of the gowns on the red carpet at the start of 2012. Has there been a collection that has caught your eye from New York Fashion week? number 4 and 5 are stunning :) Great blog! i so love her collection. The red dresses are devine! Beautiful collection. every like counts! please help me win this! omg those dresses are to die for! I am in love!! These are all so beautiful!!! So beautiful, I really love the colors in the collection. 3rd dress from the top is stunning, I am going to note this as a potential wedding dress for me! one shoulder orange dress is amazing! cute blog! i'm following you by google friends box hope you'll do the same ONLY if' you'll like mine! the perfect shade of red in the second photo. love it! omfg. how i wish i could have these GORGEOUS pieces in my possession. this collection is really wonderful! Come and follow mine if u like it as well?i'd be happy..i wait u!kiss from Milan! so pretty. 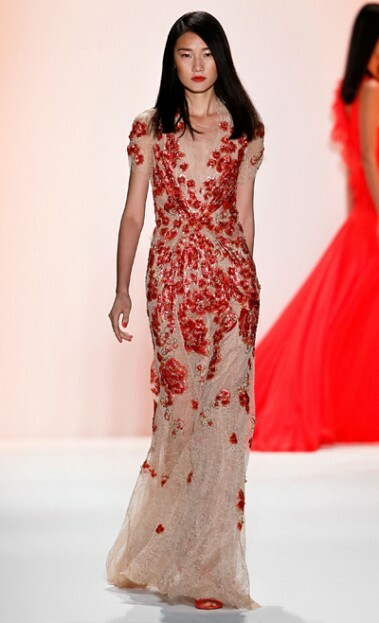 I'm in love with the second red gown.